Late last week I was complaining that there has not been a Harry Potter comic book. It seems like a no-brainer, right? Have a bunch of the wizards at Hogwarts, introduce some new characters, have some adventure. It would make a TON of money, but that money has yet to be made, so why not let DC make it? 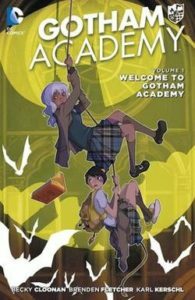 I’ve been sleeping on Gotham Academy for a while. I read the first two issues, loved them, and put it down to read other things, but since I decided to do eleven days of DC, I brought it back and read the first trade today. For me, this book is Harry Potter meets Scooby-Doo in Gotham City. If it sounds like a good combination, it’s because it is! This book is extremely fun and kid friendly without feeling forcibly kiddie, like that Teen Titans I reviewed a few days ago, and the feel is quite unique. My students write things they enjoy under the proper category with a plus sign and the stuff they do not like with a minus sign…again, under the correct category. This should help them stay organized when we finish a piece and begin our discussion/writing on the work. With that said, I would plus the heck out of this Script/Story and Aesthetics of Gotham Academy. The team on this book has created a solid story that fits perfectly in the six-issue trade arc, and the colors/page layouts do a magnificent job of setting the mysterious tone and constant intrigue found in the book. The only thing that scares me is the addition of Damian Wayne in the last couple of pages. If you read my review of Teen Titans, then you know how I feel about him, but I have also read him to be not as needy/broody, so here’s to hoping because I will be reading more of this when my 365 is up!